The Empire has foreseen an attack from creatures from a different realm. As the wind changes, their fears materialize along with the Portal of the Oni. The vile creatures are ready to invade, but the brave soldiers of the Empire are prepared to defend their land. 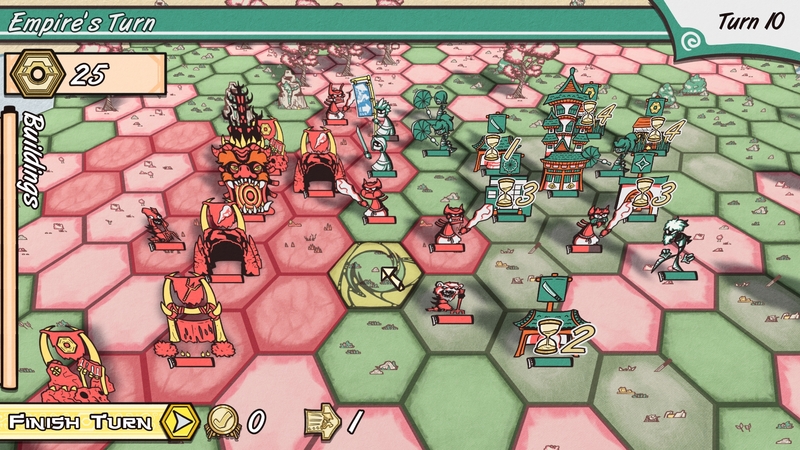 Onigami was originally developed as an academic prototype around mid-2017 and although it has since received polish and bug-fixes, it might still be rough around the edges and lacking polish in some aspects of the game. Player vs AI TBS action! Buy your buildings, place them around each other, and wait until they deploy units, which you can move around to attack the enemy! 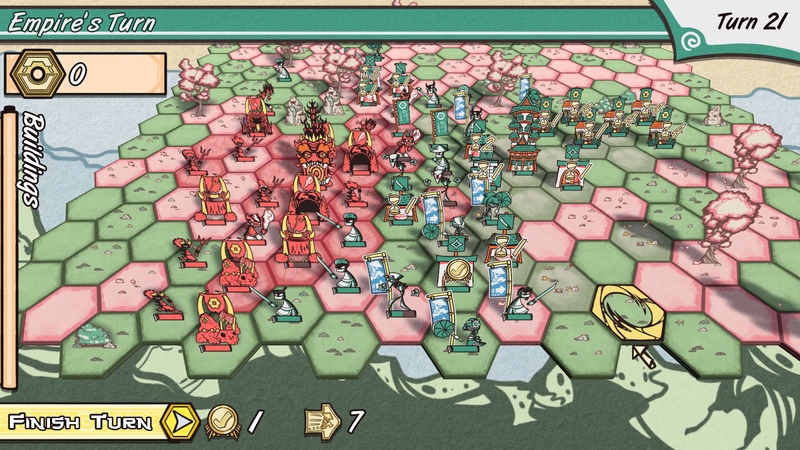 Train the All-Round Samurais, the ranged and nimble Ninjas, or the healing tactical Geishas! Push with raw strength, weaken them from afar, or flank and support with grace! Build rice fields to increase your money flow, and place banners to spread faster across the land! Choose how tall and wide you’d like to generate the world! Move the camera with WASD keys. Hover over a tile and menu with the Mouse Cursor. Hovering the Buildings pane opens it, allowing you to pick and place a building. This tab is scrollable. 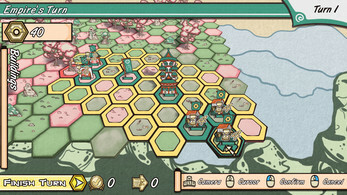 Pressing the Middle-Clicking quickly focuses the camera on the currently hovered tile. Select Units and Buildings by Left-Clicking, cancel orders or placements by Right-Clicking. Press F to quickly focuses the camera on The Empire’s Palace. Press Q and E to quickly swap between active units in the field. In control mode, the camera is independent from the cursor, as to allow you to pane the camera without having to move the cursor. Move the camera with the Right Stick. Pressing the Right Stick quickly focuses the camera on The Empire’s Palace. Move the cursor with the Left Stick. Pressing the Left Stick quickly focuses the camera on the currently hovered tile. Select Units and Buildings with the A Button or the Trigger buttons, cancel orders or placements with the B Button. Press the X Button to open the building pane, allowing you to pick and place a building. This tab is scrollable. 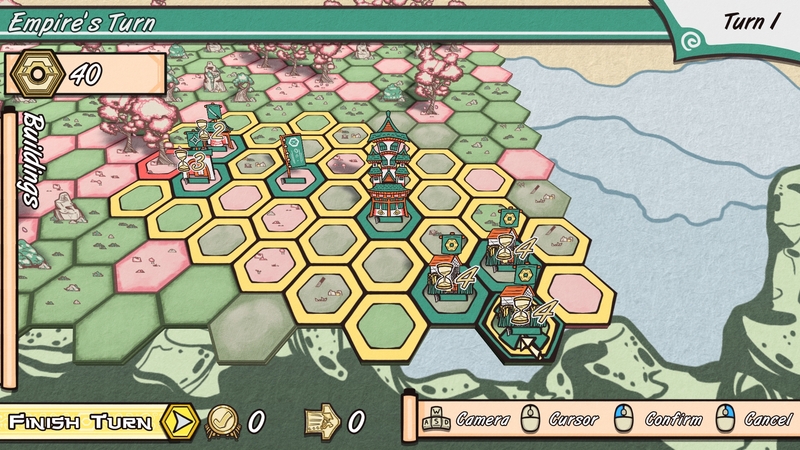 Press the Left and Rich Shoulder Buttons to quickly swap between active units in the field. 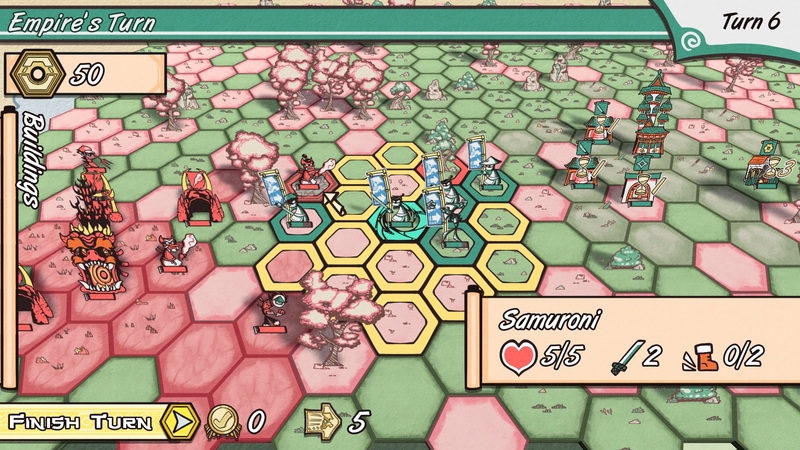 Buildings allow you to train units as well as for Gamis (in-game currency). At the start of the game, you can place them down around your palace, but each building will respectively expand the building placement limits to include the tiles around it. 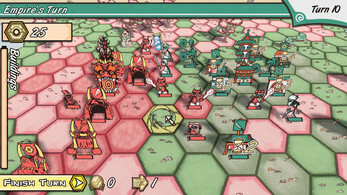 The Samurai Bell, Ninja Dojo and Geisha Theatre train units of their respective kind after a certain amount of turns after which they can be placed down and used actively. The Rice Fields will generate an amount of Gamis (in-game currency) after a certain amount of turns. 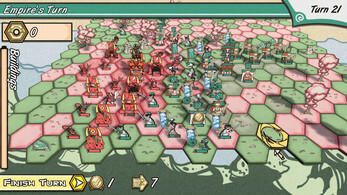 The War Banners expand the borders in which you can place down buildings by twice the amount of a normal building, but only two can be placed down at one time. 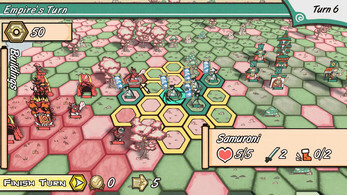 Samurai and Samurai are melee-attack based units, they can attack units, buildings or environment next to them. Ninjas and Oninjas are able to range-attack any units, buildings or environment inside of their range without having to walk next to it. Geishas and Geishoni can heal other units, so they’re always useful to have around. I really enjoyed the game, and think you have done a fine job on it. I included this in my Indie Game Showcase Wave 5. Leaving a gameplay video of it here for you. looved the art style for this game, I clicked it immediately because of it. It was a fun little game! Hello there! I would like to play your game but the Mac version is damaged or incomplete. Can you check it out please :) ?